We currently have links with schools in three countries; New Zealand, Uganda and Afghanistan. 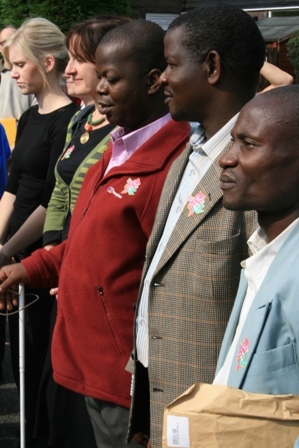 We have hosted the head teacher and a visually impaired teacher from a school in Uganda. This was a very interesting and useful experience through which everyone from staff to pupils gained a better understanding of what life was like in Uganda. The teachers from Uganda, George and Geoffrey, also greatly enjoyed their visit and went home with many new ideas and initiatives to try in their own school. We support the school not only with financial aid but also through training and support for their staff. We have established an exchange programme for the professional development from both schools. Such links provide a valuable link with the world and in developing our students’ knowledge of a less economically developed country. Our link with the Afghan school was fostered through the charity Afghan Connection (click here) run by Dr Sarah Fane. Sarah has visited the school on several occasions bringing gifts from our link school and respectively taking gifts away with her that we have made for the school in Afghanistan. 5 years ago we set up ‘COBB’ which is made up of other special schools from across the UK. We meet on a termly b asis to discuss current issues as well as share good practice with one another. In addition, we also moderate pupil attainment and progress against each others school. We are proud to be working in partnership with the outstanding schools Bettridge School Cheltenham, Oakfield School and Sports College, Nottingham, and Briarwood School, Bristol on researching best practice in the education of young people with special needs and supporting their families. In addition, we work in partnership with Sunfield School, RNIB and NAS in researching best practice in the support and education of pupils with VI and ASD.